A recent article in the prominent journal Science describes mountains, valleys and other geological formations on Mars, and suggests they were formed during the ‘Noachian Epoch’. Numerous other references are made to ‘Noachian terrain’, ‘Noachian climate’, that various valleys must have existed since ‘Noachian time’, and also that other features of the Martian landscape are ‘largely Noachian in age’. Science, 30 March 2001, pp. 2587–2591. Ironically, scientists have no problem entertaining the idea of a global flood as a serious theory—even describing it as ‘Noachian’—on Mars, a planet which has yet to evidence a single drop of liquid water! Yet in relation to Earth, which is two-thirds covered with water and where the rocks and fossils testify to the legacy of the real Noachian global Flood, evolutionary scientists scoff (2 Peter 3:3–6), deliberately ignoring the eyewitness account of that very event (Genesis 6–9). The organism that causes leprosy is Mycobacterium leprae. Comparing its gene sequence with other mycobacteria suggests it could have undergone so-called ‘reductive evolution’ in the past, i.e. lost almost half of its original genes. Being utterly reliant today on the cells of a host for survival—and even then it is almost in a state of ‘permanent starvation’—current evolutionary thinking is that leprosy bacteria became pathogens (causers of disease) which have lost the ability to reproduce in the outside world. Nature, 22 February 2001, pp. 1007–1011. Organisms that cause diseases today may have originally (pre-Fall) had the functions of returning nutrients from plant material to the soil, or being helpful partners in breaking apart vegetable matter in the digestive systems of animals. Losing information is not evolution—see ‘Muddy waters’ p. 26. NASA researchers have subjected the famous (and subsequently widely discredited) ‘Life from Mars’ ALH84001 meteorite (Creation 19(1):18–20, 19(2):8, 20(2):8) to further analysis, and claim it contains evidence of Martian life after all. Initial scientific reaction was cautious, but many experts became incredulous once they inspected the published images. One critic even said this ‘defines a new low in the great ALH84001 debate.’ Even neutral observers commented, ‘They’ve gone too far in interpreting the images,’ indicating that the researchers’ conclusions might be more wishful thinking than reality. Science, 9 March 2001, pp. 1875–1876. Evolutionary scientists are becoming more vocal in exposing Haeckel’s fraudulent intent in his infamous embryo drawings (see Creation 18(2):33–36; 20(2):49–51). Haeckel used images of embryos of various species to support his theory that different animals pass through, or ‘recapitulate’, similar embryonic stages. But it was recently shown in the scientific journal Nature that Haeckel removed the limbs from the image of a young echidna embryo (and other species also) in order to make the young embryos look more alike than they do in real life. The removal of limbs was selective, as it was done only to particular developmental stages. Haeckel’s evolution-promoting motive is clear from the text accompanying his drawings: ‘There is still no trace of the limbs or "extremities" in this stage of development...’. Nature, 8 March 2001, p. 144. When researchers find proteins such as osteocalcin in dinosaur fossils claimed to be at least 65 million years old, a majority within the scientific community is generally sceptical—for good reason. Theoretically, such proteins could not possibly last for that long, they argue. New Scientist, 6 January 2001, p. 13. But the alleged ‘proof’ of this protein surviving for 200,000 years depends on the ‘dating’ procedures on those ‘more recent’ fossils being accurate. Both these fossils and the original duckbilled dino fossils tested were likely from the time of the Flood some 4,300 years ago. So there is no reason not to accept the original premise, based on sound physico-chemical reasoning, that osteocalcin cannot survive for more than a few thousand years. Whenever such fragile molecules are found in fossils allegedly millions of years old, it is more evidence consistent with the Bible’s record of a young Earth. An archaeologist has found that the Industrial Revolution ‘secret’ of manufacturing high-quality ‘Sheffield’ steel was actually known by the Saxons a thousand years earlier. The discovery of small homogeneous steel ingots and steel-edged knives in a Saxon port buried under Southampton shows that blacksmiths made ‘modern’, very high quality steel in the middle of the Dark Ages. And a University of Cambridge researcher believes that the builders of the pyramids used astronomical calculations to accurately align their bases to face true north. Kate Spence suggests they used stars from Ursa Minor (Little Dipper) and Ursa Major (Big Dipper) to determine the celestial north pole. She says that the very slight differences in orientation of the eight pyramids at Giza faithfully trace the slow drift of these stars with respect to true north, reflecting the chronological order of construction of the eight pyramids. 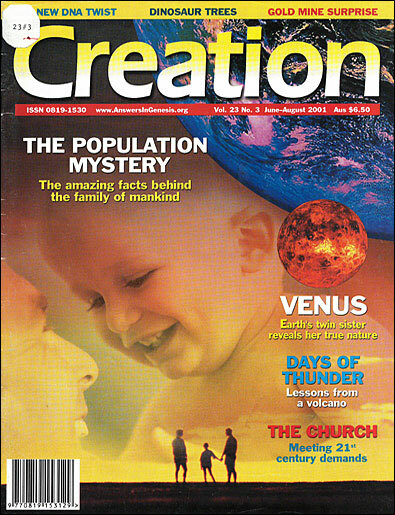 New Scientist, 23–30 December 2000, p. 7. Nature, 16 November 2000, pp. 297–298, 320–324. Man has always been inventive and intelligent. Evolutionary indoctrination leads many to erroneously think of the ancients as being more ‘primitive’ than people today. Traditionally, evolutionists have thought that New Zealand’s flightless birds, the moa (now extinct) and kiwi, were closely related, based on similarities in their physical appearance—though the moa was over two metres tall, while the kiwi is about the size of a small chicken. But comparing kiwi DNA with DNA extracted from well-preserved moa bones suggests they are not each other’s closest relatives. Instead the kiwi is now believed to be more closely related to Australia’s flightless birds, the emu and cassowary, prompting conjecture that the kiwi migrated to New Zealand from Australia. Nature, 8 February 2001, pp. 704–707. New genetic evidence is increasingly forcing evolutionists to discard old ‘evolutionary trees’ (which were based on physical similarities) and redraw them. Also, the Flood model has been criticized because flightless birds could not have crossed deep water. But now some evolutionists themselves are claiming that flightless birds somehow crossed the Tasman Sea. It is possible that some, if not all, flightless birds were originally able to fly, losing this as a result of degenerative mutation. With the British parliament voting last January to permit the cloning and maintenance of human embryos up to 14 days old (for medical experimentation purposes), and the announcement in March by Severino Antinori, Panos Zavos and Avi Ben-Abraham of their plan to create the first human clone, stronger voices of protest are now being heard from the scientific community. Experts opposed to cloning are warning that despite the much-publicized successes with animals, cloning is both inefficient and continues to be plagued by development failures both before and after birth. Even apparently healthy survivors may suffer from immune dysfunction, kidney or brain malformation (later resulting in death), as well as many non-fatal genetic defects. In short, under current cloning technology, key developmental genes are liable to be damaged. Antinori, Zavos and Ben-Abraham have tried to reassure the public by saying, ‘We can do genetic screening. We can do quality control.’ The implication is that they plan to use prebirth diagnosis to detect and eliminate their ‘failures’ via abortion. Science, 16 March 2001, pp. 2061–2063; and 30 March 2001, p. 2552. The annual celebration by secular humanists of ‘Darwin Day’, on or around Charles Darwin’s birth date of 12 February, is on the increase. This year across the USA various humanist associations, ‘rationalists’, ‘skeptics’, ‘atheists and other free thinkers’, etc., commemorated the day with conferences, films, presentations, a street parade, information booths and high school activities. The Darwin Day Web site shows the humanists hope to further expand the program in 2002 and future years and build momentum on a global level, with an ‘extraordinary event’ being planned for 2009 at Downe House, UK, to mark the bicentennial of Darwin’s birth. They even hope that governments will consider declaring Darwin Day an official holiday. The humanists (who are anti-God by their own definition) claim that ‘the Celebration itself, however, does not promote religion or non-religion and especially not anti-religion’—despite the fact that the sponsors also include the Skeptics Society and the Freedom From Religion Foundation. Darwin Day, <darwin.ws/day/>, 9 April 2001. As anticipated (Creation 22(4):7), Britain has now released its new Â£10 note, with a portrait of Charles Darwin, whose 1859 book On the Origin of Species popularized evolution. Meanwhile, a UK commentator writing in The Spectator laments the increasingly hostile anti-Christian bias in Britain today. He asks why sceptics and atheists single out Christianity for attack, but dare not criticize other religions. Sunday Mail (Brisbane), 25 March 2001, pp. 90–91. Tyrannosaurus rex has been described by a museum curator of paleontology as ‘the most putrid, foulest thing that ever lived.’ Adding that ‘The bigger you are, the stinkier you are, the nastier you are, the less other animals will mess with you’, paleontologists also believe a T. rex was likely to have a few pus-filled wounds—no doubt contributing to its overall stench. A museum in Britain wanted to duplicate the aroma in order to add realism to its newly-unveiled T. rex replica, but the smell of dead, rotting flesh was so off-putting that the museum opted for a moist earth fragrance instead. Yahoo! Science News, <dailynews. yahoo.com/h/ap/20010206/sc/eau_de_t_rex_2.html>, 7 February 2001. Thinking readers would be right to ask, ‘How can they possibly know that?’ In the same way, we should be prepared to question all such untestable claims about the past which are based solely on present evidence (e.g. fossil bones). Over the past few years, astronomers have been increasingly baffled by the discovery of objects in space which are different from anything already known. Too small to be ‘brown dwarfs’, and with their movements through space clearly distinguishing them from planets orbiting a star, this ‘strange new class of celestial body’ defies conventional definition. Once considered to be peculiar rarities, the discovery in February of more than a hundred of these objects is forcing astronomers to confront the fact that these ‘cosmic misfits’ cannot be accounted for by current long-age theories of star and planet origins, and to recognize that the theories therefore need ‘modification’. Science, 2 March 2001, p. 1680.